In case you’re new to the blog, I started a series of interviews with soldiers after writing a YA novel about a girl who goes through ROTC in high school and joins the Navy. In my research, I found so many fascinating stories, that I wanted to begin sharing them. Or maybe more accurately, I wanted to share these people. I met Tracie in college, but didn’t realize she’d joined the military until we’d reconnected on Facebook and after I was done with my book research. Man, do I wish I’d had her for a resource during my writing. Here are her answers to my interview questions. Tracie: I am in the Tennessee Army National Guard. The main reason why I choose this branch of service was because I wanted a way to further my education after graduating college and it was one weekend a month, two weeks in the summer. I felt it would fit better with my goals rather than going active duty. I was led to choose the military mostly because I have always wanted to serve in some capacity since High School. I don’t believe I was meant to join straight out of High School. I was lead to Milligan College first. Tracie: I served 13 years Enlisted working up the ranks from (E-4 to E-7 [as an acting 1SG (E-8)]). I was a combat medic during those years. On 18 March 2009 I was commissioned as a 70B Medical Service Corps Officer. Currently my job is a Medical Platoon Leader. I would normally have approx. 60 soldiers that would work for me in a Treatment Medical Clinic. Jody: When and how long were/are you active? Tracie: I joined the National Guard in 1997…and I am currently still in the service. Tracie: I joined when I was 24 years about 1 year after I graduated college. 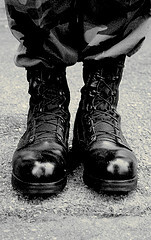 The hardest part of boot camp was going when I was older. I was with 17 and 18 year olds; most of them just out of High School; most of them immature. Of course, the military believes that if one soldier screws up everyone pays. I hated that part. The best part was finishing…I wasn’t sure what to expect…you always hear of war stories…and how bad things are…and it really wasn’t that bad. Tracie: There are a lot of stories. Not so sure about funny. One that sticks out in my memory is one from the last deployment. We were working at the Treatment Medical Center one evening. Some Iraqi’s brought a dead friend to seek medical attention. Of course we could not treat him…because he was dead. So the Iraqi’s shoved the friend into the trunk and when his arm would not bend they shoved it in breaking it…and drove away. Again, not funny…but there is a lot of insight into their culture and the way they think. Tracie: Since I am in the Tennessee Army National Guard…I have not moved except once. I lived in the Tri-Cities since I moved to Tennessee in 1989…and when I returned from the 1st deployment I moved to Knoxville, TN where I am currently residing. Tracie: Being a female in the military is unique due to the fact that there are not a lot of females in the military compared to males. For example (of course not real numbers but only as an example): Out of 860 soldiers 47 might be officers and 1 of them might be female. Out of the same 860 soldiers 813 then would be enlisted and maybe only 38 might be female. Sometimes this does make it challenging. There are days that you (meaning females) are treated just like “one of the guys” and there are other days that you (meaning females) are treated differently. I know that there are times I have felt like I have had to work harder to prove myself to others. But mostly I do feel honored to be among the few that have chosen this career path to work along with what I would call Hero’s. Tracie: It is humbling. Knowing what kind of sacrifice that soldier’s give…some more than others…but all in their own ways. It has also opened my eyes about other countries. We are so blessed in the United States. Even the poorest people in the United States have it better than those in the third world countries. The United States as good as it tries to be…is filled with such selfishness. Sometimes it is sickening to see the degree to which this is true. Tracie: The biggest thing I would like for people to know is this: Don’t always believe what you see on T.V. I am not saying that I want to go back…but there is some good that is coming out of this. I would rather go there knowing that my family and friends are safe at home then not go back to Iraq and have more incidents like 9-11. People need to realize that we the American public will never know the whole story…nor should they know the story until it is SAFE to tell the story. People get to wrapped up in the fact that they feel it is there RIGHT to know…but fail to realize that they are putting others lives at stake by having events and things being reported before it should be. Very frustrating. One of the best stories that I can share that shows some of the gratitude is: While in a parking lot getting into my car after buying groceries…ran up to me…I mean ran…I thought she was running to someone maybe behind me…once she got closer…I realized she was coming at me. Startled me…but she asked “Can I give you a hug?”, I said “yes”, she then said, “I just wanted you to know how much I appreciate your service.” She then explained that she usually tries to let every soldier she sees in uniform know that and hugs them. I was very touched. It is strange that in one day…you can get looks from those who oppose the war and will let you know that it is a waste and give you looks of death…and in the next moment…have an encounter like that one of that lady. Speaking for the soldiers, we really appreciate the prayers and support from all. Hand written letters, notes, cards of hope, of news, of anything to keep us remembering of what to look forward to once we get back, to know that people do care…are welcomed. It is the highlight of the day to receive mail especially in the age of e-mail and Facebook. Not that those aren’t good tools to keep in touch…it is just different. Well, I cannot think of anything else. Thank you for asking the questions. Jody: Thank you so much, Tracie. I’ve enjoyed getting to know more about you. And thank you for your service to our country. Tracie is presently serving in Iraq. If you would like to write her a letter, use the address is below. Loved the interview piece. Really nice. Your are a very good interviewer and journalist. Appreciate the time and effort you took to do it. Will be something that Tracie and save and keep. Thank you for sharing with us. You have a very special gift. May God continue to bless you in your work. Thanks for reading it. I appreciate Tracie’s willingness to share her experience. Young women could learn so much from her example. Thanks, also, for your kind words. Glad you stopped by. 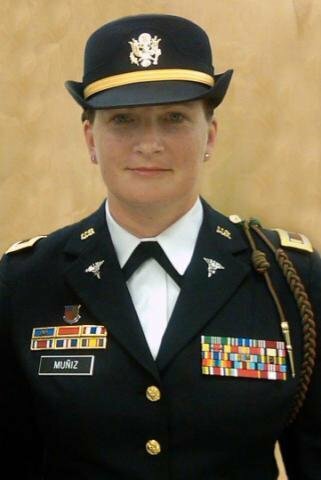 Tracie: When you were my student at Milligan College, never in my wildest dreams did I imagine that you would end up in the military as a medical officer serving our country. I am so proud of you!!! Go Tracie go! !